Well, it seems like June is off to a decidedly ‘meh’ start. Tuesday I had a dumb work function, and didn’t get home until 8, so no barn time. Wednesday Rob had her appointment to get blood drawn for her Coggins, so I got to go to the barn in the morning, which was a treat. She didn’t even flinch to get her blood drawn, and then I tacked and headed out to the outdoor to get a morning ride in. Well, she was really stupid. Lately she’s been really really looky in the outdoor – I think because it’s been cooler and windier, and because I’ve been riding alone more often. Well yesterday she was just being belligerent. She spooked at a saddle pad that had been left out in a weird spot, which I didn’t really blame her for, but then she took that allowance as permission to spook at anything and everything (but mostly nothing). We finally got trotting, where she was equally stupid – she held her head in the air, refused to have any sort of rhythm, and wouldn’t steer at all. I tried to power through it, but she eventually spooked (at nothing!) out from under me. My neck still hurts, ugh. I did get back on and trot some more, but we just weren’t accomplishing anything at all. She ran out of the ring, continuously spooked, and refused to give me any submission. When she finally put her head down for a split second, I stopped trotting. We did get some good ToF. 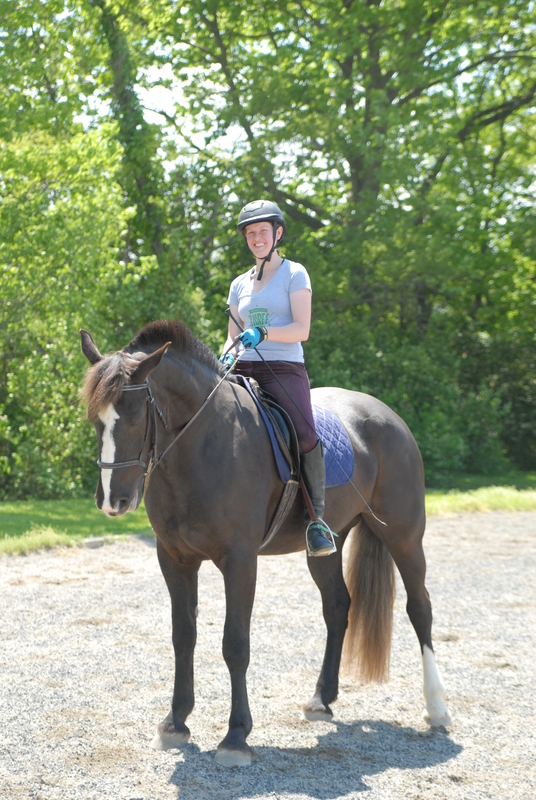 I practiced a bit more, since we couldn’t practice anything at the trot or canter. She definitely understands what I’m asking for going to the left, and I think we made some definite progress to the right. Lesson on Friday, so we’ll see what Michele says! We’re jumping tonight (hopefully, though it’ll have to be inside, ugh), and showing 2’3″-2’6″ hunter division on Saturday. Hope I can stay on. < Previous Turn on the Forehand – Practice!